Discounts and demos at Frank Harvey Hi-Fi open evening | What Hi-Fi? If you're in the Coventry area on the evening of Wednesday, November 30th it might be worth popping in to Frank Harvey Hi-Fi. They're having an open evening from 6.30pm onwards, with top kit on show from the likes of Arcam, Bryston, Sony, Naim, Cyrus and KEF. And there'll be a range of discounts on offer for those who attend. "We’ll have the Arcam AVR400 and BDP100 Blu-ray player with a KEF R series 5.1 set up in one room, and the new Bryston SP3 processor with a Bryston 9Bsst2 multi-channel power amp supplying a 5.1 system based on the new PMC twenty series loudspeakers in another", the company tells us. PMC/Bryston will have two representatives on hand. Arcam will also have a rep at the event, and a "yet to be decided" prize to be won – as well as an exclusive preview of the company's new full-size DAC. Visuals for both AV rooms will be supplied by Sony with the new VW30 and VW95 SXRD home cinema projectors. Also on demo will be Naim's new SuperUniti, along with other streaming products like the NDX, Uniti, UnitiQute, and the new ND5xs, all via KEF R series loudspeakers. Cyrus will be demonstrating its range of streamers too. KEF will be showing its innovative Blade loudspeaker, which will be paired with a Cyrus system consisting of StreamX digital streamer and CDXTse2 CD transport sources, DACxp+ digital pre-amplifier, and four Mono X300 power amplifiers. Visitors will even be able to win a pair of Q300 loudspeakers. For turntable fans, Michell will have the TecnoDec, Gyro SE, and Orbe SE on display, as well as the limited Gyro Seduction. They’ll also have a goody bag to give away too! 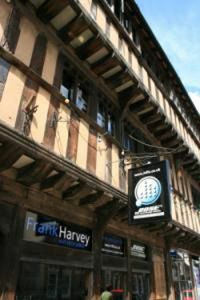 Frank Harvey Hi-Fi is based at 163 Spon Street, Coventry CV1 3BB and can be contacted on 02476 222622 for further details.